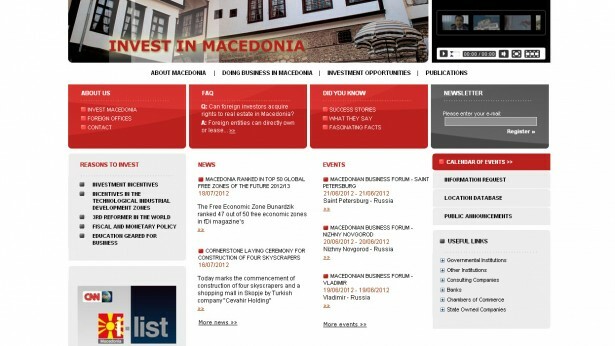 Invest in Macedonia to be the ultimate information source for every investor interested in Macedonia. Quick and easy access to every needed information including administration and legal frameworks as well as success stories . Contemporary web solution supported with advanced administrative module, developed specifically for this client enabling Agency independence in aspect of regulating / modifying content in realtime. Moreover, one of the main features of the new site is dynamic changing of the the blocks i.e. content position. Finding answer to every question you may have about Macedonia. How can I visit Macedonia? How do I register a company? How much does it cost to register a company? What are the biggest banks in Macedonia according to total assets? Questions about taxes, Technological Industrial Development Zones in Macedonia, real estate investment, sector analysis and reports and so much more. 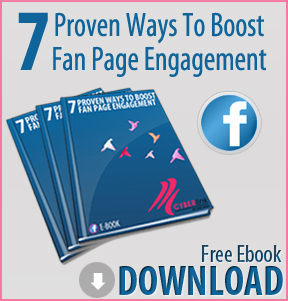 Invest in Macedonia incorporates many modules enabling the visitor pleasant experience while on this page. It incorporates basic info about the Agency as well as Macedonia with the more personal FAQ and Information Request Modules. The web site is enriched with additional modules like Newsletter, Events, Location database, Public Announcements, Useful Links, News, Publications, Tenders and announcements, module for promoters document exchange (DMS). etc. 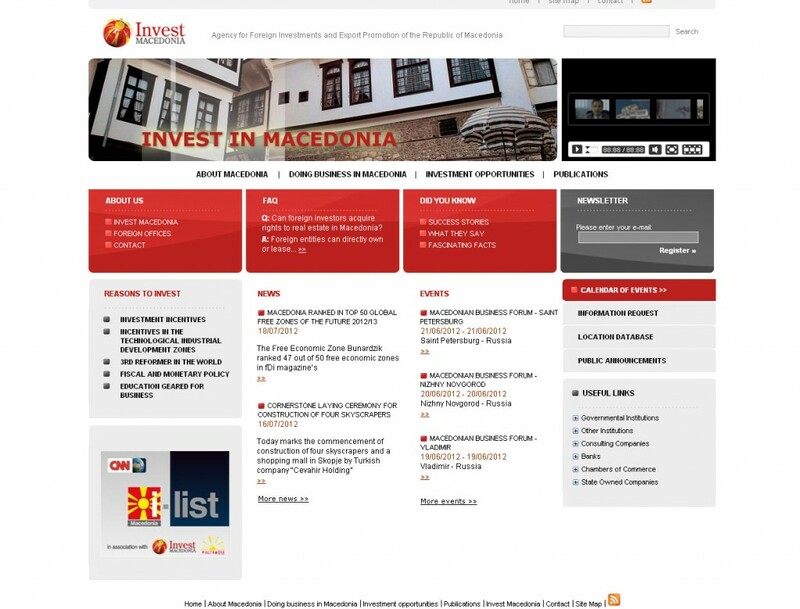 Invest in Macedonia offers rich content about the economy sectors,Technological–Industrial Development Zones (TIDZs) identified as centers in which highly productive clean manufacturing activities are concentrated and new technologies are developed. Also one has insight in the latest Investment Programs as well as the investing oportunities in the SME development. Find your potential partner/project by sending online Information Request. Choose your sector and send your request to Invest in Macedonia.